Speak of the Devil… I was just talking about Conrad Keely’s (of Trail of Dead fame) album artwork for The Sword and what do I get in my mail? A notice for a one night only Keely art show. 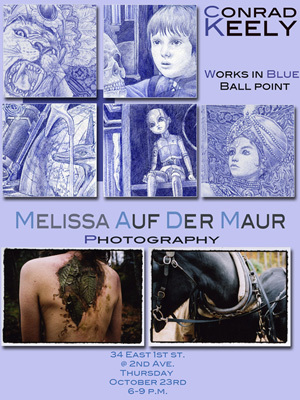 His Works in Blue Ballpoint will be shown next to Melissa Auf Der Mar’s photography on Thursday October 23rd from 6-9 at 34th East 1st Street @ Second Ave.